We serve all of North East Ohio's photo needs including Cleveland & Akron areas. While our in-home studio is nestled against one of Cleveland's beautiful metro parks in Richfield, Ohio, we travel to all surrounding areas in Cleveland & Akron for photography. Not sure where to have your photoshoot in Cleveland or Akron? We have many location ideas and will be happy to have a FREE consultation to come up with the perfect location in the Cleveland or Akron area. Need us to travel further? No problem. Contact us today for a consultation about where in Ohio we can photograph! At Liza Sue Productions we offer premium photo services to the Cleveland & Akron areas including: family, engagement, newborn, infant & children portraits, senior & fashion photo sessions, professional corporate & headshot sessions, twilight home photos, drone & aerial photography and videography, real estate & property photos along with full service staging, marketing and graphic design services. Our style includes traditional, retro, vintage, high-fashion and classic. Check out our galleries below to see prices and examples of work! With the exception of our traditional headshot process, we are known for our portraits utilizing natural light. Our studio is located on an edge of metro park giving us nature as our backdrop! Richfield is also nestled against the heart of the Cuyahoga Valley National Park, which also gives us easy access to many other amazing forest, field and park scenes. Most of our family, senior and baby portraits are scheduled around sunset during the golden-hour which provides magical backlight. Additionally our real estate day-time photos are typically scheduled during mid-day sun when the natural window light is most-likely to light the interior of the property beautifully. Twilight photos are of course scheduled at twilight hour - shortly after sunset - which provides amazing skies with glowing warm windows. We start with a free phone consultation. After hearing what your vision for the photoshoot is, we discuss and brainstorm ideas for the perfect Cleveland or Akron location, we give outfit recommendations and set up a time and date. You'll then be emailed a link to easily reserve your customized photo session and make your deposit. During portrait photoshoots, you'll be fully guided through poses to capture the perfect look - right down to the detail of how to place your fingers! The best photos will be emailed to you digitally via a Dropbox link. All photos are delivered unbranded and we allow our clients to have full copy-right free printing or use them for whatever purpose they like! If you want extensive editing on your images we offer many different photoshop & editing packages including our very popular in-person editing sessions where you get to sit down with Liza personally and be fully involved in the editing process! Liza Sue Studebaker is our head photographer with 15 years of experience in the photo, fashion, interior design and real estate business. Living in North East Ohio for the last 13 years, Liza is an expert at finding unique photo locations to fit your needs in the Cleveland & Akron area. Liza's four year art-degree focused on fashion, design and photography combined with over a decade of real-life experience in the photo field, sets her apart from other Cleveland & Akron photographers. Liza's creative mind is always coming up with new and amazing photoshoot ideas and locations in the Cleveland & Akron area. Years of modeling experience have given her an advantage on how to get clients into the most flattering poses with ease. With her down-to-earth, bubbly, professional, positive attitude - she always makes her clients feel confident and comfortable. Her perfectionism creates flawless images and her natural intuitive eye captures artistic compositions that tell a natural story through photography. Call Liza today for a free photo consultation! Pulte Homes of North East Ohio, Howard Hanna Cleveland & Akron, Keller Williams Cleveland & Akron, Coldwell Banker Hunter Realty of North East Ohio, Cleveland Living, American National, Diyanni Homes of North East Ohio, Drees Homes of North East Ohio, Retro Rosies in Lakewood, Ohio, Cybele's Alterations in Mentor, Ohio, Constant Aviation, Nurenberg Paris Law Firm in Cleveland, Ohio and more! We are proud partners with DASH Aerial - who provides Cleveland, Akron and all of North East Ohio with some of the most beautiful aerial & drone photography and videography available! See our amazing drone & aerial work here. We are also proud partners with Cleveland's Premier Boudoir Photography featuring unique vintage pinup work and traditional boudoir. Click here to see our Premier Boudoir website. Liza Sue Productions is one of the largest real estate photography firms in North East Ohio. We service all the greater Cleveland and Akron areas with our premium real estate photography services including - traditional interior and exterior real estate photography, twilight home photography, drone and aerial real estate photography and videography, 3D tours, luxury listings, Photoshopping interiors and exteriors, staging services and graphic design, marketing and social media management for Realtors. We have 100% customer satisfaction with 100% positive reviews. We are the leaders in real estate photography for new builds and new home construction. 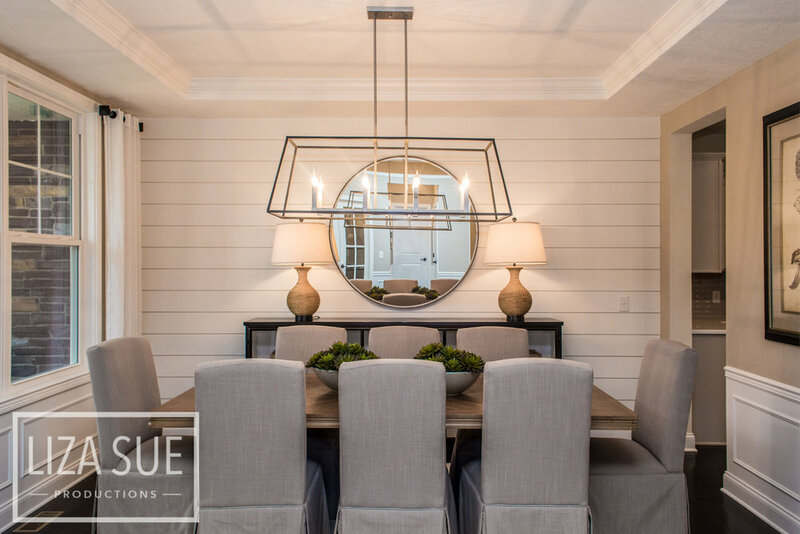 Our clients include Pulte Homes, Drees Homes, Diyanni Homes and more! Try us and see why we are the #1 trusted real estate photographers in Northeast Ohio! Check out all the details on our amazing real estate photo services here. Liza Sue Productions is the leader in headshot photography for professionals, executives, Realtors and associates. We have 100% customer satisfaction and 100% positive reviews from all of our headshot clients. Our unique in-studio headshot process includes dozens of photos taken with expert coaching on how to capture the perfect angle. We then show you the headshots right on the spot and help you select the perfect photo for your profession. Next we do an in person Photoshop editing session to perfect the headshot! We remove any blemishes, brighten your teeth and eyes and edit it to perfection - right while you watch. This unique headshot process is what ensures our customer's satisfaction - guaranteed! We also offer off-site headshots and can travel to your business or corporate office. Find out all the details on our amazing headshot photo sessions here.